Ready To Use Vermiculite/Rock Wool Mixture. 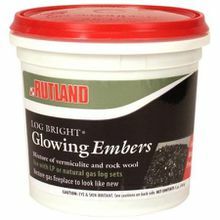 "Glowing Embers” vermiculite and rock wool mixture replaces the original material that came with your gas log set. Decorate the firebox outside the burner pan on natural gas fueled units to renew the realism of your fireplace. Do Not Put Vermiculite in Natural Gas Fireplace Burner Pans!